What is a Transportation Management Association? A Transportation Management Association (TMA) is a formal organization of businesses and local governments dedicated to solving local transportation concerns. TMAs usually focus on the travel needs of large employers, and are often created to give businesses a voice in local government transportation planning, to advocate enhanced mobility, and to reduce employer costs of implementing individual worksite transportation programs through economies of scale. TMAs tend to be located in areas where there are large concentrations of employers. TMAs have been successfully formed in downtown areas and suburban employment centers. However, TMAs have recently been initiated in rural areas, across regions, and along congested roadway corridors during disruptive reconstruction projects. Other TMAs are being formed to address transportation concerns unique to the tourist industry or for major institutions, such as airports, hospitals, and universities. What are some of the benefits of TMAs? Operational - administration and service delivery. TMAs are usually nonprofit organizations whose members are private companies and public-sector organizations. Organizational members pay annual dues. In addition, TMAs can supplement their budgets with fees charged for services performed. TMAs provide information on current issues and initiatives for member businesses. They serve as transportation "consultants" for businesses wishing to implement TDM programs such as carpooling, vanpooling, and parking management. And they work with local governments, transit agencies, and other transportation providers to promote improved transportation services. Are there any TMAs in the Dallas-Fort Worth Area? TMAs are not a new development in the Dallas/Fort Worth region. Two TMAs currently operate within the Dallas-Fort Worth Metropolitan Area. 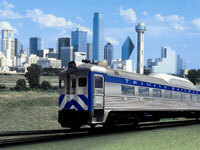 The first TMA in this region, the Central Dallas TMA (CDA), operates in the Dallas central business district (CBD). CDA focuses on transportation issues affecting the Dallas CBD. In 1998, CDA facilitated the implementation of Pegasus Parking, a seamless parking garage system that utilizes tolltag technology. The second TMA in Dallas-Fort Worth, the Downtown Fort Worth Transportation Management Organization (TMO) began operation in 1999. Tthe Downtown Fort Worth TMO assisted with the planning of an Intermodal Transportation Center and is assisting with the implementation of wayfinding sign improvements in the Fort Worth CBD. You can contact the North Central Texas Council of Governments at (817) 695-9240 or the Dallas Area Rapid Transit at (214) 749-3241 for further information concerning TMA development.